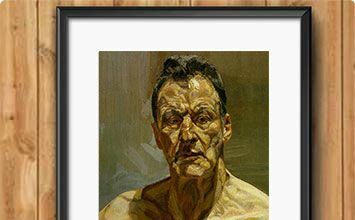 Lucian Freud is a German-British painter, and the grandson of Sigmund Freud. He devoted himself almost entirely to portraiture, applying richer colors and impasto brushstrokes. In 2000 he was commissioned to paint England's Queen Elizabeth II. Francis Bacon was an Irish-born, English painter and one of the 20th century's most celebrated and controversial existentialist artists. Although he believed in avoiding abstraction and exploring the human figure, unlike his fellow members of the London School, Michael Andrews did not primarily paint portraits, but instead depicted physically empty scenes filled with the implication of human presence and drama. Painting what he knows, Leon Kossoff created works based on what he saw in his London neighborhood. Kossoff's portraits and cityscapes are all painted with his signature impasto. R.B. Kitaj was a Jewish-American figurative artist who primarily worked in England and is part of the School of London (a term he coined). Frank Auerbach's portraits and cityscapes capture the intensity of the everyday, making the mundane striking. His paintings are intense, meticulous studies of people and places; the recordings of the order that he imposed on the chaos. David Hockney is an English painter, photographer, collagist and designer. Hockney's influence was particularly felt during the Pop art movement on the 1960s, yet his work has also suggested mixed media and expressionistic tendencies. Although based in London for most of his career, Hockney's most famous paintings occurred during an extended trip to Los Angeles, in which he painted a series of scenes inspired by swimming pools. Howard Hodgkin often employing simple geometric forms, hard-edged shapes and only a few colors in his mostly abstract canvases. "You want accuracy, but not representation. If you know how to make the figuration, it doesn't work. Anything you can make, you make by accident. In painting, you have to know what you do, not how, when you do it." Less a stylistic movement and more a social group of artists who explored similar themes, the School of London revolutionized figurative painting after World War II. Not named such until 1976, a diverse group of artists, including R. B. Kitaj, Lucian Freud, Francis Bacon, Howard Hodgkin, Leon Krossoff, Michael Andrews, and David Hockney, explored the human form and devastated landscapes in the wake of the physical and moral destruction wreaked by war. They wrote no manifestoes or credos and painted in diverse styles, but they mostly probed autobiographical subjects, including portraits and settings of friends and intimates. 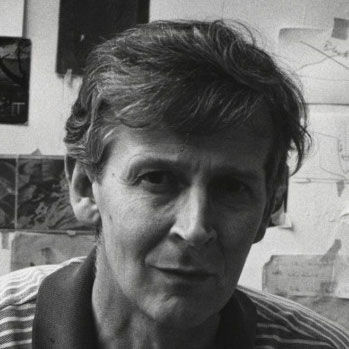 Finding commonalities with other artists across Europe and even in the United States who were not committed to pure abstraction, the School of London generated enormous interest in figurative painting among a younger generation of artists, including Jenny Saville, Cecily Brown, and Peter Doig among many, many others. Like many artists after World War II, the School of London artists attempted a reckoning of recent history and tried to imagine new ways of seeing oneself and one's fellow human beings. Like contemporary philosophers exploring Existentialism and phenomenology, the artists attempted to break down old habits and modes of seeing in order to recreate new ways of interaction. Paintings created by School of London artists ranged from pristinely smooth to thickly encrusted surfaces, but in all instances the artists hoped to convey the psychological depths not only of their subjects but their own as well. At times empathetic and other times damning, the artists depicted their subjects through their own personal lenses, creating complex portraits and landscapes that spoke to uneasy times. The artists combined influences of the Old Masters with popular culture, film, and literature, giving their subjects a seriousness and probity that had not recently been seen in figurative painting but that still felt current and recognizable. Many of the School of London painters were already well-established and even famous prior to the naming of the group, and they came from a variety of backgrounds, carried different influences, and painted in a myriad of styles. Kitaj's Life and Passions (2013): Tracy Bartley, Derek Boshier, David N. Myers in conversation with Paul Holdengräber.